After only one week sitting with my mentor Damien it was very apparent that stamps considerably speed up processing of documents. While signing centres usually have a good collection of stamps they are necessarily generic stamps that all JPs can use. Where the stamp wording should include the JP's name it pays to have your own personalised stamps. Damien immediately recommended I use a stamp supplier in the USA who go by the fairly memorable name of RubberStampChamp.com which is obviously their web address. Even allowing for the $8 freight charge per order the stamps are around 30% of the cost for any Australian supplier, and frequent special deals make them even cheaper. I have used them on several occasions. 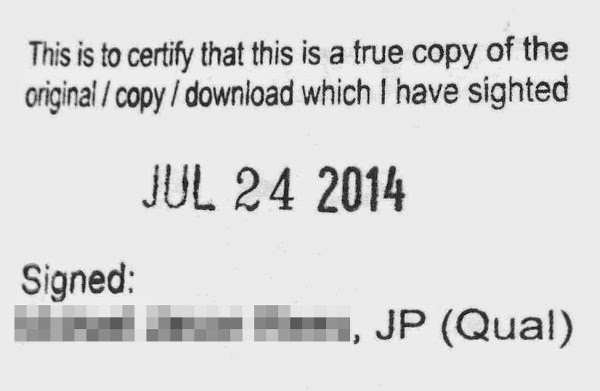 My pride and joy is the Shiny certified copy stamp that incorporates adjustable date wheels albeit in the US format. RubberStampChamp allow complete control over text weight, font, and layout in an easy web format so ordering is accurate and convenient. Apart from the seal this stamp just needs the alternatives crossing out and signing. Over the hundreds of certified copies I have made over the months this stamp has saved many minutes if not hours.